I was not planning on doing a prophetic word for June 2018 because the word for May 2018 is still very much in play right now. However, God just gave a current word that I felt it was important to share. A quick update on the Prophetic Series, here is the first post in the series. We’ll put one up every Wednesday and it will be about 4 – 5 different posts. This is a short word with a lot of information. This is the month of the business man and the business woman. It is Sivan on the Hebraic Calendar. But not only business but love. Business and love. There is a lot of adjustments and realignment going on the spirit realm right now that is causing the alignment of relationships in business and love. God is going to end some relationships, the weeding out process and starting new ones. When the relationship ends – business or personal – know that God has to move them out of the way to make room for the new. Some of the relationships that will end you won’t see it coming. The way in which He is going to do this is very supernatural. Actually, I can’t stop laughing because many of you will be thinking this is going to happen one way and it will happen in another. Keep your eyes open! When it happens you are going to be blown away. You are going to know beyond a shadow of a doubt that God brought that connection. 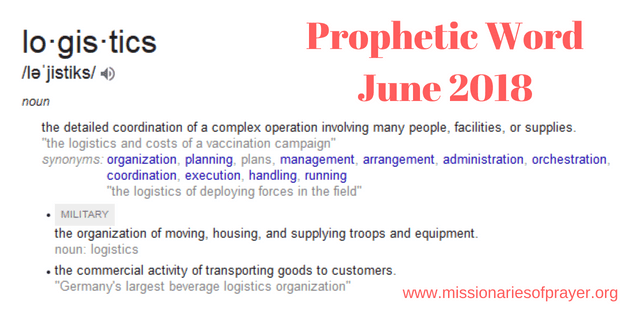 Here is the word – LOGISTICS! Angels are working to bring together the very thing that you have been praying for but you need to understand that most things require other people’s involvement. As such, the angels have to work on getting you where you need to be and also lining up others so that they are where they need to be. This takes time, your cooperation (and the cooperation of others), your obedience and logistics need to be arranged. What you do while this is happening is you keep standing in faith and praying. It’s going to happen. The enemy can’t stop it. But he can get you to abort it, with your words and actions. Watch what you are saying. Speak faith and life over your dreams! 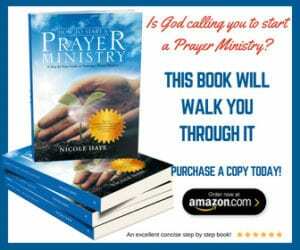 Daniel fasted and prayed for 21 days before he received the answer to his prayer, what would’ve happened if he gave up? (Daniel 10:1-4). The angels are activated by the word and will of God and follow through based on your faith and the words that you speak. Demons do the same as well (Philippians 1:28). Get plugged into the Spirit of God and stay plugged in. He may ask you to make one small adjustment but if you are not plugged into God you won’t hear when he tells you to move two steps to the left…or cast the net on the other side of the boat. You may think how is this one little thing going to change anything? But it will!! 1. Make sure you have your desires in check. What I mean by this is the enemy also knows what the desire of your heart is, yes he does! So you need to make sure you are not making it an idol and putting it before the Lord. If you do, the enemy will use it to lead you off the path. Please know that your desires are not bad but if you focus on it too much the enemy will use it against you. Put the desire under subjection to the Almighty God and don’t let it lead you. 2. No time for distractions! If “it” or “they” are taking up too much of your time that you know needs to be spent working on what God told you to do, then you need to get rid of that distraction. You’re half way there!!! Don’t give up. I know some of you already have breakthrough in some areas but that was just the beginning there is so much more coming for you. Be expecting more! We want to hear from you….How is your year going so far? Have you seen some breakthrough? Share in the comments below. Wow this is amazing, is exactly what i heard in the spirit this morning. That is a mighty word for June!!! God has already blessed me so much this year, from getting married, in September 2017, to purchasing a new car in April 2018, to getting a new job in April 2018. I am forever grateful to him for all he has done and what he is going to do. My husband and I know it is not over yet, we are asking God to bless us with children and are standing firm on his word that this precious gift will happen before the end of the year!!! I need a prophetic word from the Lord. I have been in a situation for 25 years with no resolution. I am desperate for a word from God. I am exhausted but I also feel in my spirit the struggle is over, which means my breakthrough is around the corner. I’ve gone to many revivals hoping for a word from God but others get their word. Brigitte, I will send you an email to walk you through this. Check your email. God has been sooooo good to me and my child. The year began positively. on new year eve survived a nasty road accident that would have claimed my life. God is merciful, am grateful. My businesses have been profitable, until last month (no orders), however, beginning this month more clients inquiries are coming, Yes and Amen. I’m just reading this @ 10:56 PM Central time. A guest pastor at my church just preached this on 6/3/18. Praise God for this word being established!! Yes, JESUS! Awesome update! I have been feeling the same expectations myself and you just confirmed them for me! Praise the Lord!!! Thank you again for your faithfulness! Thank you for your prophetic word for the month of June 2018. As in every word from the Lord, let us give thanks to God’s grace for his words endure forever and ever in Jesus mighty name Amen and Amen.